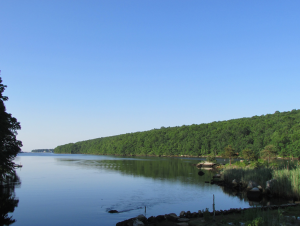 The Oswegatchie Hills in southeastern Connecticut comprise an exceptional and undeveloped coastal forest on the Niantic River. It is also one of the state’s most vulnerable parcels of open space. A third of this forest is at risk of being lost forever to high density development that would ruin sensitive wildlife habitats and threaten water quality. That’s where Connecticut Fund for the Environment/Save the Sound enters. We’re uniting our unique mix of legal expertise and coalition-building skills with local grassroots efforts to permanently preserve the land. View the Save the Oswegatchie Hills mini documentary here. Learn more about the Save Oswegatchie Hills Coalition here. The Hills rise sharply from the Niantic River and create a union of spectacular rock formations, rugged forest, wetlands, and vernal pools that provide a home for a multitude of native plant and animal species. Its coastal location provides a safe haven and refueling stop for migrating birds. And, the Hills provide important protection for the delicate ecosystem of the Niantic River, a tidal estuary that flows directly into the Long Island Sound. The southern two-thirds of the forest is protected as the Oswegatchie Hills Nature Preserve, threaded through with trails that provide hiking and birdwatching for citizens from around the state. The owner of the threatened parcel of 236 acres, Landmark Development, LLC, seeks to construct 840 units of housing, with 1,767 parking spaces and 36 acres of pavement and hard surfaces. Not only would the diversity of animal and plant life be harmed by this development, but stormwater runoff carrying pollutants from the acres of impenetrable surfaces could threaten water quality on the land, as well as the river below. Connecticut Fund for the Environment is leading the legal fight to protect Oswegatchie Hills in administrative agencies and in the courts. Two local environmental grassroots organizations, the Friends of the Oswegatchie Hills Nature Preserve (the Friends) and Save the River-Save the Hills (STR-STH) formed fifteen years ago when Landmark Development, LLC first proposed development. CFE spearheaded the formation of the Save Oswegatchie Hills Coalition, which consists of a broad range of civic leaders, residents, and environmental groups, who advocate preserving the Oswegatchie Hills. CFE fought the development in the East Lyme Zoning Commission on behalf of the coalition; that case is now on appeal in the Superior Court. CFE is also representing the Friends and STR-STH in an Appellate Court case arguing that the developer should not be granted a large portion of the town’s extremely constrained sewer capacity. The Save Oswegatchie Hills Coalition is working locally and across Connecticut to protect this unique landscape. View and print the factsheet here. Add your organization or business to the Save Oswegatchie Hills Coalition by filling out the coalition sign-on letter coalition sign-on letter and email it to Suzanne Thompson at sthompson@ctenvironment.org. Contact Suzanne for more information on how you can help preserve and protect the Oswegatchie Hills.